We Are the Best!really is the best. Lukas Moodysson’s breakout 2002 film Lilya 4-ever was a grim portrait of a teenager descending into prostitution and slavery. 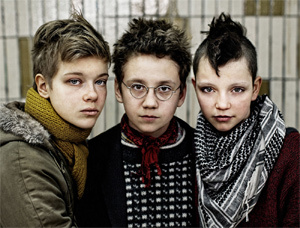 With We Are the Best!Moodysson returns to teenaged protagonists — 13-year-old girls. His protagonists this time are treated gently, sweetly, with the perfect blend of love and freedom both by their parents and by their director. Rebellious punk music seems to come naturally to 13-year-olds. It’s not learned, it’s innate. Moodysson is very good about conveying the social milieus of middle school. The popular kids diss Klara and Bobo, with their punky hair, as “the prettiest girls in town.” It’s not that Klara and Bobo don’t want to look pretty, but given their genes and their dispositions, it’s not really their decision. They fit in where they fit in. It’s been foreordained. At the teen center, a heavy metal band, Iron Fist, always hogs the practice room and blasts their obnoxious music, ruining the fun Klara and Bobo were having. One day they reserve the practice room on paper if only to annoy Iron Fist. They don’t know the first thing about musical instruments, but there is a drum kit, and a bass, and if they play loudly and badly, at least it will annoy those stupid heavy metal boys. Klara and Bobo realize they’re not very good when it comes to music. At the school talent show they watch for someone who can help. Enter Hedvig (Liv LeMoyne), the quiet Christian girl who’s just about as popular as Klara and Bobo. She’s a natural on guitar, with a pretty voice. And all the popular kids seem to tease her, so that’s an added bonus. But the good-girl Christian thing doesn’t quite fit. There is some strife as Klara, Bobo, and Hedvig work out their differences. Klara and Bobo convince Hedvig to go with a new punk haircut. Hedvig’s mom is aghast and shames the other girls by turning the tables on their own peer pressure — threatening them briefly to promise to go to church every week or else face police prosecution. But all of We Are the Best!’s parents, Hedvig’s included, are very loving and strike the perfect hands-off/hands-on balance. Klara’s dad barges in to a practice session: “Can I jam with you?” Then the little sister shows up on her toy piano. The band switches from “Hate Sports,” to “Hate all parents,” laughing all the way. We Are the Best!might drag a little when the girls go off in search of a real punk band and a New Year’s Eve party. But Moodysson has a few surprises that keep the proceedings appropriate to the world of young teenagers. Then Moodysson gives the girls an ultimate victory lap: they land a concert in a nearby town called Vasteras, and it couldn’t possibly go any better — if you’re a punk band. We Are the Best! is sweet, a little rebellious, but reassuringly safe. Moodysson nearly accomplishes the impossible: making 13 seem like a great age to be.